I hate eating cheesecake, but I sure love making it! There is something fun about the process, and that fact that I have a no-fail recipe, I feel absolutely comfortable playing around with the ingredients. Some of you may remember my New York style cheesecake. That was my first time ever making a cheesecake and as nervous and scared as I was, it all worked out. Then I made a lemon cheesecake topped with candied cranberries for Christmas. I knew I would be revisiting the cheesecake again, and today is the day! This salted caramel cheesecake was made for my sister’s boyfriend’s birthday. I actually made it on time this year, unlike the New York style cheesecake. However, there were some mishaps along the way. My caramel sauce got a little darker than usual. My family does not mind at all the darker taste, but I was worried about Tyler. I was taking pictures for a tutorial on how to make the caramel sauce by using the dry method for a future post. 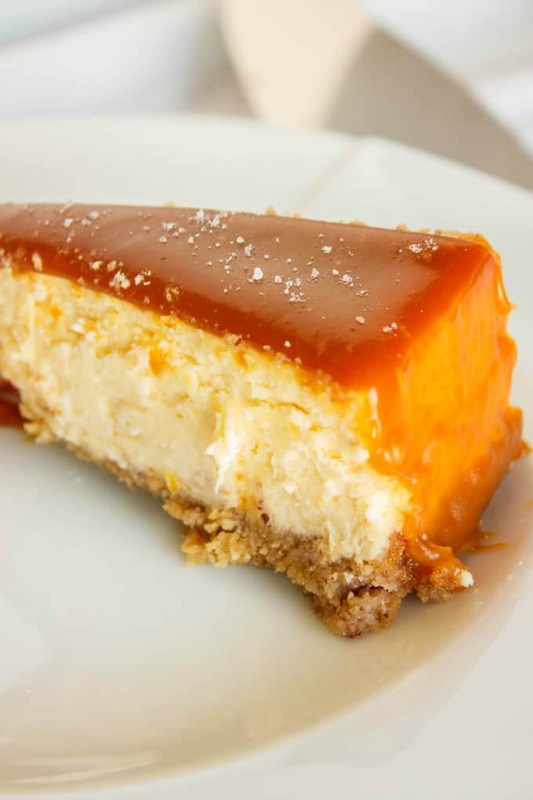 However, with the salt on top and in the caramel, plus paired with the lime in the cheesecake, all the flavours came together. Then there was the mishap of pouring the caramel sauce onto the cheesecake. As seen in previous posts such as my chocolate ganache cake, and coffee-caramel cake, I am pretty good at pouring caramel onto a cake and allowing it to fall gently over the sides. Well, I don’t know what happened, but I must have heated my sauce too long in the microwave because it literally coated the entire cheesecake! Dan liked the look of the salted caramel cheesecake, and really, my sister was right, would Tyler really care what the cheesecake looked like?! Then the last mishap. The delivery. My poor sister. I forgot to warn her to not have the heat on too high in the van. We have really cold temperatures here in Canada right now so that is hard, but if the heat gets to the caramel, it is going to melt everywhere. And that it did… Supposedly it was all over the van. Sigh. No luck this time around! She wasn’t mad and stated she should have known better but I still felt bad. All that aside, I think this salted caramel cheesecake looked awesome and tasted pretty darn good (for me not being a cheesecake lover!) Dan enjoyed two slices before I gave the cake away and he loved it. I really want to get a 5 or 6-inch springform pan so I don’t have to continue making these 10-inch cheesecakes. They are great for parties but they serve so many people, and let’s be real, no one needs a 20 servings cheesecake for their birthday… Or do they? 1 cup crushed ladyfinger cookies (I pulsed 20 of them in my food processor) *use all pecans for a gluten-free recipe. Add ladyfingers to a food processor and process until fine crumbs appear. Pour into a bowl and add pecans to the food processor. Process until finely ground. Add to ladyfingers along with sugar, salt, and butter, stirring until combined. Press crust into the bottom of your 10" springform pan. Bake at 350F for 10-12 minutes. Remove from oven and allow to cool. *I forgot to grease my springform pan but my cheesecake still turned out. Don't fret, things happen! Grease the sides of your 10' springform pan with butter (don't worry about the bottom part.) Wrap a couple of layers of aluminum foil around the outside of the bottom of the pan (and about half way up the sides of the pan.) Do not skip this part! Have available another pan that is big enough to hold your 10" springform. Add the eggs and sour cream into a large bowl and beat well with a hand mixer. *Note, you will see I am not using a stand mixer. You really do not want to over-beat this cheesecake, trust me! In another bowl, add in the cream cheese and butter. 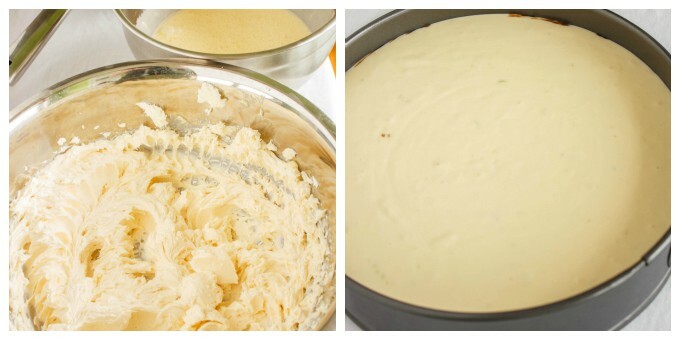 Mix with your hand mixer until smooth (no lumps.) Pour this mixture into the sour cream mixture. Beat again until combined and smooth. Add in the sugar, cornstarch, vanilla, and lime zest. Beat until combined, about 2 minutes (you want a nice, soft batter, but you don't want to over-mix either.) Pour half the mixture over your crust and shake/jiggle the tray for a smooth layer. 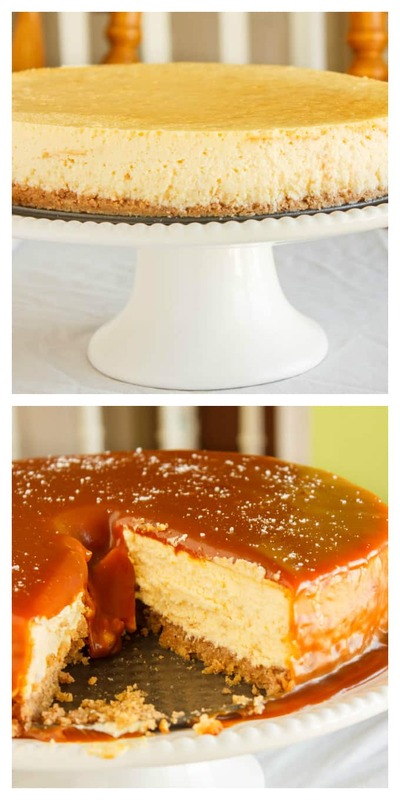 Drizzle your 1/4 or 1/2 cup of caramel onto that layer. Pour the remaining batter carefully on top of the caramel layer. Place into the larger pan. Fill the larger pan up with hot tap water, just about halfway up the springform pan. Remove the pan from the oven and transfer the cheesecake out of the water and onto a cooling rack. Leave the aluminum foil on for the first 30 minutes. Then remove the foil and continue to cool completely. Cover and refrigerate overnight preferably. When chilled, remove the springform pan sides from the cheesecake. Pour on the caramel sauce carefully (I find heating up the caramel a bit helps in this process.) Immediately put back into the fridge to prevent caramel from pooling over the sides. Chill again for an hour. Top with your favourite salt and serve! As said above, I did do a tutorial for my dry method caramel sauce recipe. I find it much easier than the wet method, and much less intimidating. Just make sure you are paying attention and not taking pictures! 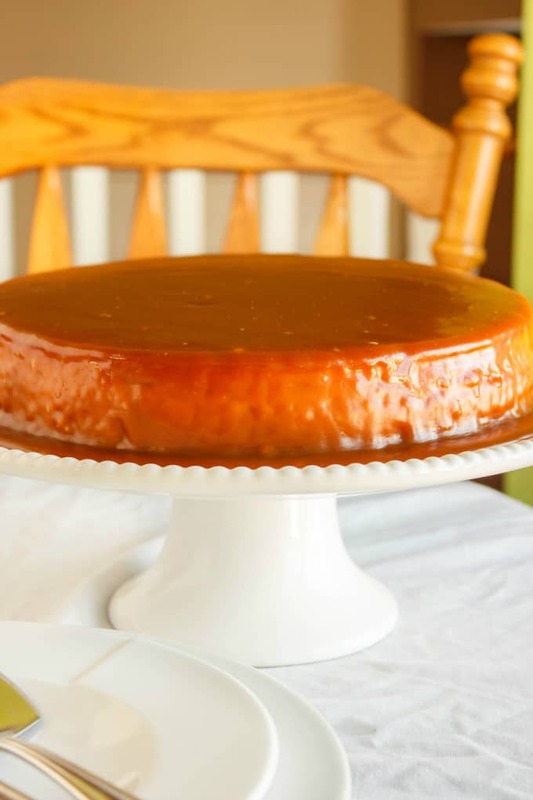 I have a friend who travels the world and she made this caramel sauce for her boyfriend’s cake and it turned out perfectly! Of course, I was so excited to make this cake that I forgot to grease the pan and forgot to wrap it in aluminum foil! Thankfully I could add the foil afterwards, but some water did leak into the pan. 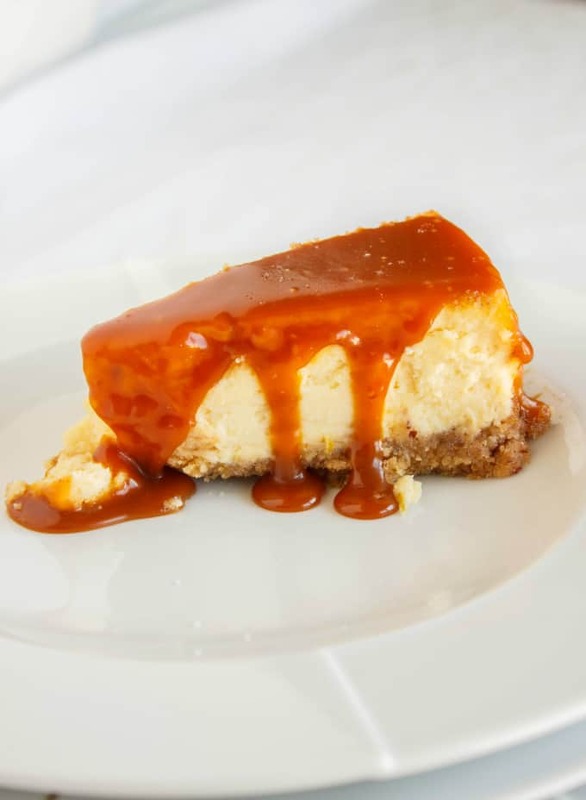 Man, looking back, I had a lot of hiccups along the way, but you would never guess when you look at the pictures of this salted caramel cheesecake! Don’t let my mishaps scare you, everyone has a bad day in the kitchen once in a while. Looks amazing! I should have eaten breakfast today. You are making me very hungry! This is hilarious. Kinda reminds me (although is not as bad) of when I was baking birthday cupcakes (which I was completely experienced at) and my in laws were there and I forgot to add the sugar! Ooops! Ironically I LOVE the way the side that is totally encased in caramel looks. I think you should aim for it more often! Yum! Sign me up for a slice of THIS! I must have read that wrong -- I could have sworn you said that you hate eating cheesecake. You WHAT?! Oh man, I LOVE cheesecake! But I'll forgive you, because this looks amazing! I can't do it!! I love cream cheese but not in my dessert... That is a lie, I like cream cheese frosting but the sugar masks the cheese taste! This looks amazing, "mishaps" and all! I'm the opposite of you: love to eat them, but not make them! Beautiful photographs! You had me at salted caramel- this looks delicious. My cheesecake loving husband would be thrilled to find this on our table. This sounds like perfection in my book - love how rich and inviting it is! That just looks CRAZY good! You don't like cheesecake?! Feel free to make another and send it to me. I loooove cheesecake but I hate making them. I just have the WORST luck with springforms which results in a huge mess in my oven. But yeah, this looks awesome and I totally wish I had the skills to make it! I can't bring myself to like them!! I always forget to grease my springform and my hearts sink each time. I must have some awesome luck when it comes to cheesecakes! Kacey, Love your step-by-step directions and your willingness to show us that sometimes your food doesn't cooperate. 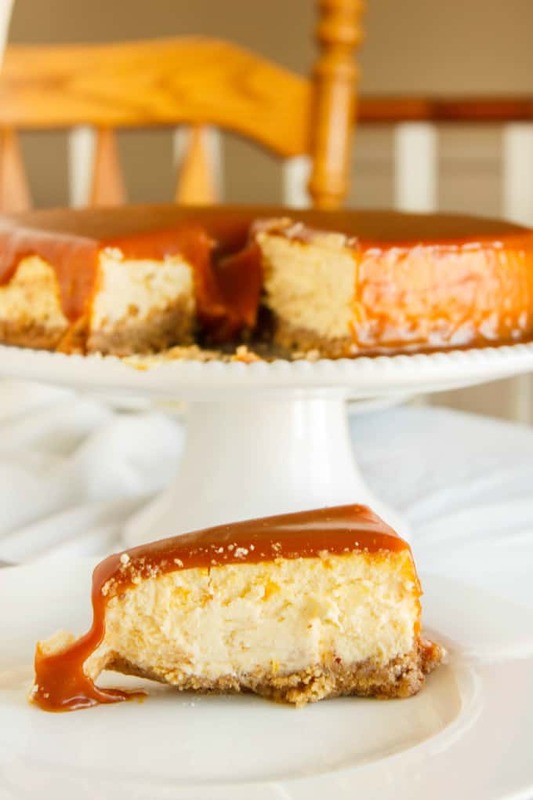 (I was gasping sympathetically as you described the caramel flowing down the sides of the cheesecake and covering them too completely.) Plus the end result looks scrumptious to me - as a dedicated cheesecake lover, I'd be glad to take this one off your hands. Thanks so much, Laura. Trying to show people cheesecakes are not too scary :) I'll make them and share them with anyone! I'm sorry, but I thought you said you don't like eating cheesecake. I must have misread that! I love cheesecake. 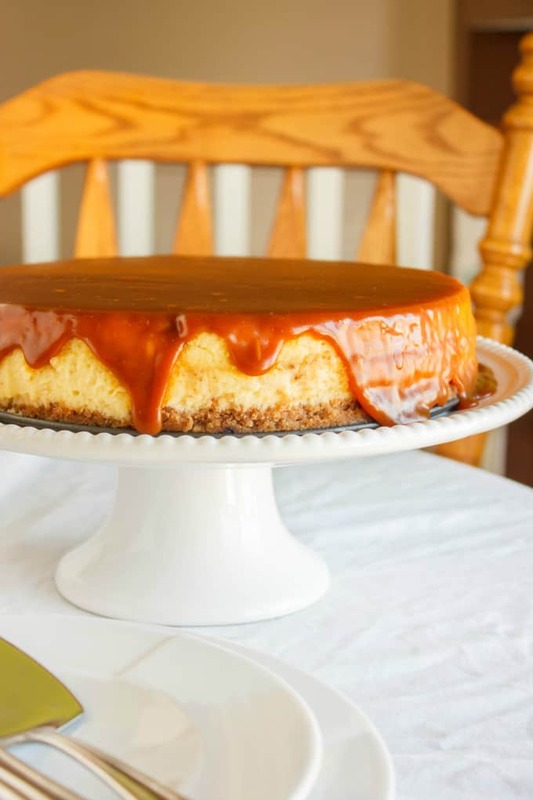 Caramel completely covering cheesecake is even better. This looks perfect! LOL! All those snafus and your cheesecake STILL turned out great. :-) It looks amazing. I love those flavors. This cheesecake looks insane. That caramel top is amazing! I love the darker color of it - that just means more delicious flavor!! Exactly! I prefer the darker flavour but I always worry what others will think. Looks like perfection! Love the ooey gooey caramel! YUM! This looks AMAZING. I'm going to make it for my Mom's birthday this coming weekend but I am curious, what did you set the pan in after you wrapped it in foil? I'm unsure of what to use and I don't want to mess it up! Thank you. Merry Christmas! This recipe turned out great!! It baked beautifully without any cracks. My piece of advice is to make the caramel first so that it has time to thicken and cool off. Also, make sure your ingredients for the cheesecake are definitely room temperature. Mine weren’t quite there and it caused the mixture to be super lumpy so I took it through a fine mesh strainer which seemed to take care of the issue. I also didn’t add whiskey to the caramel since we were out and it still turned out great. I only added 1/2 tsp of salt to the caramel which was just right for me, anymore would have been too salty. Try it as you add smalls amounts and decide what’s right for yourself. I decided to be fancy and add a cool caramel decoration which makes the cheesecake stand out and it’s super simple! Melt another cup of sugar then allow it to cool slightly, Then pour on the back of an oiled ladle spoon. This created a really cool globe of caramel strands that I added to the center of the cake. I totally agree with making the caramel sauce ahead of time! The more time I have spent in the kitchen, the more I have learned. When it comes to baking, I am all about room temperature ingredients, and like you said, it really makes a difference! Been meaning to update the pictures for this recipe, however, every time I make this cheesecake, it gets eaten before I can get my camera out!